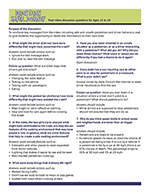 After watching the video, use these questions to reinforce key messages from the video, including safe and unsafe pedestrian and driver behaviors, and to give students the opportunity to relate the information to their own lives. The questions may be assigned as individual work or for discussion in a small group or with the entire class. Also available in Word format, so you can add your own questions.